Here is a quick nail art look I created using some water decals. My index and ring fingers were first painted with Kleancolor Metallic White and the middle and pinky fingers were painted with Viscous Vampire by Pretty Serious. Over the white polish I placed a water decal that featured mini fruits as well as little silver glitter dots. 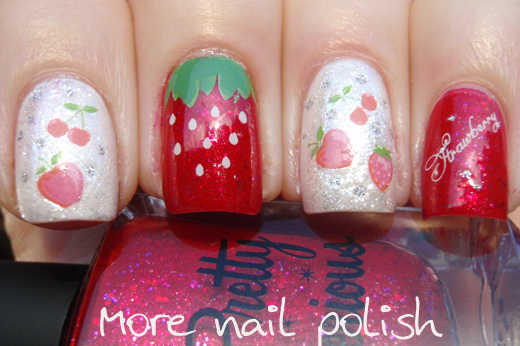 The pinky finger has a water decal that say's 'strawberry' and some silver glitter dots. 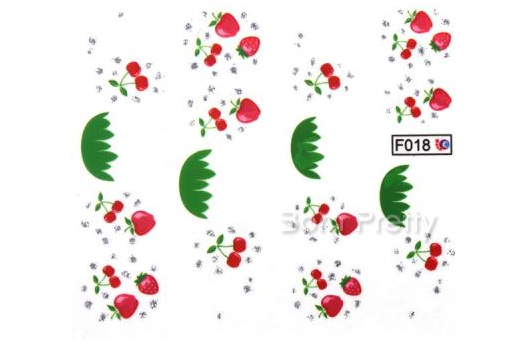 The middle finger has a water decal that has the top green part and the white dotted seeds. When I showed Mr 5 my nails, I asked him what they looked like, knowing that he liked strawberries and it should have been a pretty easy guess. 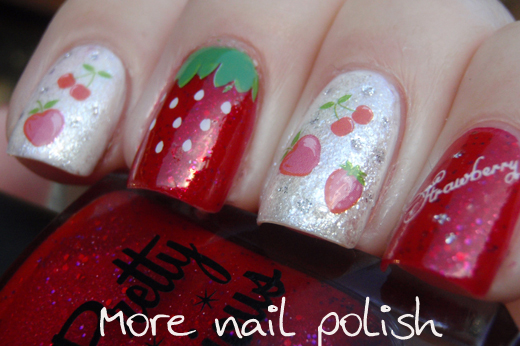 His reply was, those white nails have apples, cherries and strawberry's, and that middle finger has snow falling long green grass. He was looking at my nails upside down, and totally nailed the description. As soon as I turned my hand around he said, look that one changed to a strawberry. I got these water decals from the Born Pretty Store. This is the set of water decals looks like. You could get two manicures out of the set (you can't see some of the designs because they are printed white). The set currently sells for just over $2. These water decals are a very good quality. The slid off the backing paper after being in water about 30 seconds. The only difference I noticed was that the red printing on the fruits was much paler on my nails and appeared more pink compared to the image on their site. I'm really a big fan of water decals. 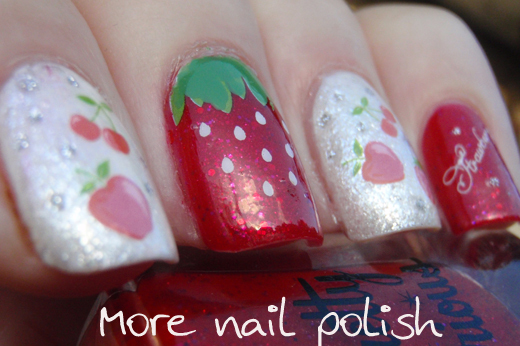 It's so easy to create a very intricate nail art design and you really don't need much skill at all.